What Are Conservatives Gonna Do NOW?? Up until those last half dozen words, I was completely cool with Il papa argentino. But let's set them aside and talk about the faith-based scientifically illiterate folks here in the USA. What are they to make of the fact that Pope Francis did not declare evolution "just a theory"? What are they to make of the fact that the leader of the Roman Catholic Church did not appeal to the secular authorities to "teach the controversy" in order to nudge Intelligent Design into the public school curriculum? My guess is that they'll call him a communist who doesn't understand The Bible like they do. Pope Francis delivered an off-the-cuff, mini-encyclical on the rights of the poor, the injustices of unemployment, and the need for environmental protection Tuesday, saying he's not preaching communism but the Gospel. Francis' remarks to the World Meeting of Popular Movements, delivered in his native Spanish, ran for more than six pages, single-spaced. It was one of the longest speeches of his pontificate and a clear sign that the issues are particularly close to his heart. Francis said the poor need land, a roof over their head and work, and said he knew well that "If I talk about this, some will think that the pope is communist." "They don't understand that love for the poor is at the center of the Gospel," he said. "Demanding this isn't unusual, it's the social doctrine of the church." Today is Jonas Salk's 100th birthday. He was born today in 1914 and he was instrumental in the fight against polio - with a vaccine. A growing anti-vaccination movement, coupled with ongoing difficulties in reaching underserved populations, is taking a global toll on efforts to eradicate infectious diseases, new data from the Council on Foreign Relations suggests. Polio, measles, mumps, rubella and whooping cough are all preventable with safe, low-cost vaccines. Yet the council’s Vaccine-Preventable Outbreaks Map shows hundreds of thousands of cases of those diseases worldwide from 2006 to the present day. Within the United States, where access to childhood vaccines is almost universal, measles outbreaks in May 2014 reached a record high for the past two decades. A vast majority of those afflicted had not been vaccinated for religious, philosophical or personal reasons. According to the Centers for Disease Control and Prevention, 17,325 cases of whooping cough, also known as pertussis, were reported in the U.S. from Jan. 1 through Aug. 16 this year -- a 30 percent increase from the same time period last year. A recent report by The Hollywood Reporter revealed the consequences of Los Angeles' plummeting vaccination rates: The city has seen more than 1,300 cases of whooping cough this year alone, and some of the hardest-hit areas are LA's most affluent neighborhoods. Lower vaccination rates have also been linked to recurring measles outbreaks in Great Britain, with more than 2,000 cases reported since 2013. This is one of the things that happens when science is displaced by non-science. A man has been taken in for mental evaluation after allegedly vandalizing the Ten Commandments monument at the Oklahoma State Capitol. U.S. Secret Service Agents say it all started after a man walked into the Federal Building in downtown Oklahoma City Friday morning making strange threats against the President and Federal Government. Agents say he then admitted to them that he crashed his car into the Ten Commandments monument at the Capitol, then left his damaged car and walked to the Federal Building. The Secret Service says the man told them that Satan made him crash his car into the statue. He also told agents that Satan told him to urinate on the statue. As much as I am against the placement of the Ten Commandments on public property (any public property), a private citizen taking it upon him or herself to demolish the monument is quite simply the absolutely wrong way to go. A very bad idea. The legal process must be respected and it must be allowed to play itself out to its inevitable end: the removal of all religious monuments from all public properties. According to investigators, the man says he is bipolar and had been off his medication for quite some time. But this incident does raise some interesting theological questions. Setting aside all of the details regarding the accused's bipolar state and so on, what if he was a Satan worshiper and held the sincere religious belief that he was working under Satan's instructions? That demolishing the monument was simply, for him, an act of faith? On the flipside, what if there were a Satanic monument somewhere and someone else, acting under a similar set of divine instructions, were to destroy that one, would they get away with it? I mean, if we indeed live in a post-Hobby Lobby America, where corporations can "refuse to obey laws they don't like" as long as it's based on a conflict with it's "sincerely held religious belief", why couldn't an individual do the same? If demolishing a Ten Commandments monument was an act of sincere faith (and I am not saying that it was in Oklahoma, we're still talking hypotheticals here), wouldn't any law pre-emptively banning such an act be a violation of the First Amendment? Back to reality. If the guy who ran over the monument is bipolar, it's absolutely necessary for him to get all the help he needs to get as healthy as possible. And demolishing the monument is still a very wrong act, regardless of its inevitable unconstitutionality. More data to consider when we're considering the source - World Net Daily's Joseph Farah. Was the world created 6,028 years ago today? That’s a question that will drive fans of Richard Dawkins and Stephen Hawking up the wall. I don’t know that it was. I don’t think anyone but God knows the actual day of creation. Yea, but still it probably wasn't. But one of the greatest biblical and historical scholars of the 17th century, Archbishop James Ussher, meticulously calculated all the data he could find about the day of creation, and that’s what he came up with in his famous “Annals of the World,” a great companion to your reading of the Bible. That's it. That's Farah's evidence. And the evidence for a very Old Earth? Spontaneous breakdown or decay of atomic nuclei, termed radioactive decay, is the basis for all radiometric dating methods. Radioactivity was discovered in 1896 by French physicist Henri Becquerel. By 1907 study of the decay products of uranium (lead and intermediate radioactive elements that decay to lead) demonstrated to B. B. Boltwood that the lead/uranium ratio in uranium minerals increased with geologic age and might provide a geological dating tool. As radioactive Parent atoms decay to stable daughter atoms (as uranium decays to lead) each disintegration results in one more atom of the daughter than was initially present and one less atom of the parent. The probability of a parent atom decaying in a fixed period of time is always the same for all atoms of that type regardless of temperature, pressure, or chemical conditions. This probability of decay is the decay constant. The time required for one-half of any original number of parent atoms to decay is the half-life, which is related to the decay constant by a simple mathematical formula. I take the Bible literally – and seriously. And the Bible strongly affirms a date in the neighborhood of 6,000 years, at least for the age of man, who was created on the sixth day, according to Genesis. If that’s not true, it calls into question the rest of the Bible’s accuracy. It also calls into question the rationality of someone who takes it so seriously and literally that he's willing to abandon all of science. Look, if you want to believe the literal Bible, that's fine. We live in a free society and you're free to believe what you want to believe, But simply believing it doesn't make it science. Nor does it make anything you believe to be true, to be, in fact, true. Birther Central is now just a little more infected with teh crazie. Conservative members of Congress may not be ready to acknowledge the reality of climate change, but the Pentagon sees it for what it is — a threat to national security. On Monday, the Pentagon issued a report assessing the immediate dangers of climate change. And here's the report itself. The report — described as a Pentagon road map — identifies four things that it says will affect the military: rising global temperatures, changing precipitation patterns, more extreme weather and rising sea levels. It calls on the department and the military services to identify more specific concerns, including possible effects on the more than 7,000 bases and facilities, and to start putting plans in place to deal with them. More broadly, the report warns that as temperatures rise and severe weather increases, food, water and electricity shortages could cause instability in many countries, spreading disease, causing mass migration and opening the door for extremists to take advantage of fractures in unstable countries. Wattsupwiththat.com , which bills itself as “the world's most viewed site on global warming and climate change,” says the water temperature of the Great Lakes is more than 6 degrees colder than last year at this time and 3 degrees colder than normal. Experts say should the trend continue, the lakes could freeze over earlier. And that could impair Great Lakes shipping. This global warming stuff is getting ridiculous. Hmm...ponder that for a bit because that's what the braintrust wants you to believe. Well it has in my head anyway. Yea. It doesn't get much better for the Corbett Tom. But it is Corbett who’s being dishonest here. He knows exactly what Wolf is proposing, because he was standing only a few feet away from him during an Oct. 8 debate in which Wolf sketched out his plan. So whenever you see the TV ad you can know for sure that it's a lie. 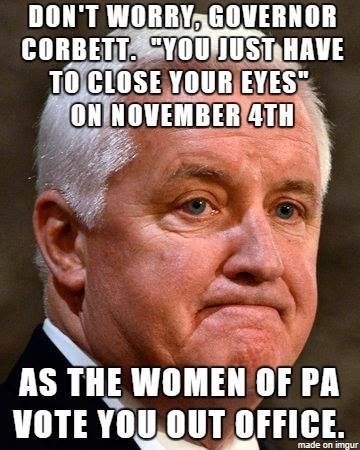 The Corbett Campaign is lying to you whenever they show it to you. Tom Corbett: Desperate and Dishonest. How else can you explain such a fleeting connection with the truth? But did you know that it's all based on a smeary lie? Look at the image. It reads, "Wolf calls for income tax increase" and references that to PoliticsPA. And yet the first line of the ad claims that "Tom Wolf is going to raise the income tax on middle class families." You can't get much more dishonest than that. The interesting part about all this is that while the (at best) misleading Corbett ad references PoliticsPA on the tax increase, all the information above is actually found at (now wait for it), PoliticsPA. If Corbett had better ideas than Wolf, he'd be spending his money telling us all about them. Instead he's using his money to mislead the electorate, the people he hopes will vote for him. Can't get much more desperate than that. A black woman smiling in the background of a group picture that appears at the bottom of every page of Pennsylvania Gov. Tom Corbett’s campaign website is actually a stock image, photshopped in. What, they can't find an actual picture of the Governor speaking with actual African-Americans to use on the campaign website? Dear Russell Brand, If not voting is the answer, why is it exactly what the GOP wants? I have, on occasion, enjoyed Russell Brand's humor, but I've had it up to here with his appearing on every talk show urging people not to vote. I'll take Rotten over Brand on this one. The Tribune-Review Misguides Its Readers On Climate Change. Again. The implication is clear: no more warming! But look closer at the sentence - "global mean surface temperature" has not risen. Is the mean surface temperature the only way to gauge global warming? No, it isn't. But we've been down this road before, haven't we? So, with your indulgence, O Gentle Reader, I'd like to trace this story through the climate denier distortion machine. First we look to Heartland. What do they say about this? According to satellite data released this month by Remote Sensing Systems (RSS), which provides data used by NASA, NOAA, and the National Science Foundation, the global mean surface temperature has not risen for 18 consecutive years. This extends the so-called “pause” in global warming to a new record, one not predicted by the climate models of the United Nations’ International Panel on Climate Change (IPCC). Ah. Now we have a NASA source for the data - Remote Sensing Systems. More on that in a bit. But if you look at the title of that page, it's obvious that it's a follow up to an earlier page - it's a "comment on" sort of thing. According to Professor John Christy, director of the Earth System Science Center at the University of Alabama/Huntsville, October 1 marked the 18th anniversary of no warming as measured by Earth’s climate satellite system. Despite a continued and marked rise in emissions and atmospheric concentrations of carbon dioxide, Earth’s temperature has plateaued for the past 18 years. (There's a link to this CNS News piece on Christy at the bottom of the page.) So wait, so this isn't from Heartland? It's only passing through the Conservative/Libertarian think tank from another right wing "news" source? Why didn't the Tribune-Review tell us that? Do I need to mention that CNS News is owned by the Media Research Council and about the financial links between the late Richard Mellon Scaife and his Tribune-Review and his stake in MRC/CNS News? But besides all that (which frankly is enough to erase any credibility the braintrust has in this matter), what does Remote Sensing Systems actually have to say about the global mean surface temperatures? Over the past 35 years, the troposphere has warmed significantly. The global average temperature has risen at an average rate of about 0.13 degrees Kelvin per decade (0.23 degrees F per decade). Climate models cannot explain this warming if human-caused increases in greenhouse gases are not included as input to the model simulation. The troposphere has not warmed as fast as almost all climate models predict. Wait. Not warmed as fast? 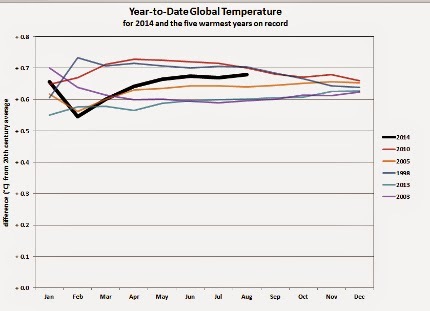 But Heartland said that according to RSS data, the warming stopped! The Trib braintrust dutifully echoed and amplified Heartland and said it "hasn't risen" in 18 years! But the folks they're all telling us about told a different story, didn't they? Interesting how that happens in the well funded right wing news/noise machine, huh? Meanwhile the warming's still going on - in the oceans and not on the surface. See that black line? That's this year so far. Third highest of the five highest on record. Saturday night’s performance of Johannes Brahms’ “Ein deutsches Requiem (A German Requiem)” by conductor Markus Stenz and the St. Louis Symphony Chorus and Orchestra was given an unexpected element by demonstrators protesting the death in Ferguson of Michael Brown. As Stenz prepared to give the downbeat after the intermission, voices on the main floor began singing the civil rights-era standard “Which Side Are You On?” with some added lyrics. (They had fine voices, too.) Others moved to the front of the dress circle boxes to unfurl three home-made banners, join in the song, and drop paper hearts printed with “Requiem for Mike Brown” onto the seats below. Well-dressed and polite, the mostly college-age protesters left peacefully when they finished, chanting “Black lives matter!” They received a smattering of applause from both audience and performers. The symphony has held benefit concerts for Ferguson. These are artists. Artists have responded to this movement from the beginning. I went to Elizabeth Vega with the idea and we found that Brahms Requiem would play in mere weeks. We melted in our chairs at the sheer beauty of that connection. She said, "Requiem for Mike Brown!" She immediately contacted Derek Laney and then artist Jelani Brown (who designed the banners) and we began bouncing ideas around. We wanted to try something that might possibly be persuasive. That's when the idea for the rain of confetti heart invitations was hatched. And then we came to the realization that we could disrupt without interrupting if we tuned things well. The real magic wasn't in the planning though. It was in the people who all came together, slightly terrified, after long work weeks and many other protest events. Some had only recently been arrested and several participants needed coffee just to get started. But the adrenaline of doing something that right kicked in and our voices came together and somehow we pulled it off. They who sow in tears, shall reap in joy. I turned 51 today. My wife and I were in Canada for the weekend and I woke up my usual early time I'm much more of a morning person than she is. It looked like it was going to be a better than average (for me) birthday but by mid-morning, I was missing a phone call I knew I wasn't going to get. You see, my mom (who passed away this past February) and I had a sweet and curious birthday tradition. Every fifth of October she'd call me on the phone to tell me the story of my birth. I'd listen quietly and intently each year even though I knew the details from my previous birthday. "You were a very easy birth," she'd say. "You can thank your older brother for that." "It was early in the morning. We were living in the apartment in Hamden and I woke up and knew it was time," she'd continue. "I tapped your father to wake him up. 'Al,' I said. 'It's time to go.'" "Ok," she would say he said. "I'll make us some coffee." "No, Al. We have to go now!" "Ok, let me put on my suit." And so they went to the hospital for my very easy birth. I heard that story every year for more than 20 years - until this morning. And I missed it. Closing the Gap: 50 Years Seeking Equal Pay is a one-hour talk show special taped live before a studio audience. It is produced by WQED Multimedia in partnership with YWCA-Greater Pittsburgh. I'd written a few times about the Wage Gap (most recently, fact-checking HBO's John Oliver) and, after having seen the program I have to say I found it educating and valuable. If you haven't seen it and if QED rebroadcasts, it would be a good idea to check it out. Most notably absent during the hour long discussion was the phrase "equal pay for equal work." Indeed, from the beginning, the panel acknowledged that while the "$.77 on the dollar" is accurate, it doesn't take into account any of the reasons (education choice, career choice, child care, etc) for the gap. Once those reasons are taken into account, the gap shrinks to 7%. This was stated early on in the program. As I've written before, any such gap is unacceptable but I have to add that 7 percent is also a far cry from 23 percent. The program spent a large chunk of time addressing those reasons and calling for a number of solutions to deal with them; greater access to child care, greater paycheck transparency and so on. On the issue of educational choice, they panel seemed to take the position that women are somehow pushed into lower paying educational/career choices, However much this is in place in our society, it's wrong. Simply and immorally wrong. On the other hand, if a woman chooses to study a field that she knows will bring her less money as a career, then that can't be a point of criticism regarding the less money she brings in pursuing that career. That's a separate argument from whether those careers are adequately valued in our society. If it's the case (and I think it is) that, say, elementary education is mostly populated by women and that those jobs pay less than other, similar, male-dominated jobs, then the society needs to address that situation. If those jobs are valued less because "they're women's jobs" (regardless of who actually does them - a man or a woman) then that's just as wrong as paying a woman the mythological $.77 on the dollar for every dollar a man makes - for the same work. Glad I spent the hour watching the program. The Braintrust Gets The Facts Wrong. Again. It's a pretty safe bet that President Obama won't be invited to the CIA's Christmas party this year. Mr. Obama, in an interview with CBS' “60 Minutes” on Sunday, once again blamed the nation's foreign intelligence-gathering service for supposedly underestimating the rise and wherewithal of the terrorist group known as ISIS. But given the facts, the president must share the blame. For as more than a few astute intelligence watchers have reminded, the White House was informed and warned of the gathering storm. Well I think, our head of the intelligence community, Jim Clapper, has acknowledged that I think they underestimated what had been taking place in Syria. Ok, then. So what did Clapper say? What we didn’t do was predict the will to fight. That’s always a problem. We didn’t do it in Vietnam. We underestimated the Viet Cong and the North Vietnamese and overestimated the will of the South Vietnamese. In this case, we underestimated ISIL [the Islamic State] and overestimated the fighting capability of the Iraqi army.... I didn’t see the collapse of the Iraqi security force in the north coming. I didn’t see that. It boils down to predicting the will to fight, which is an imponderable. So Clapper said the Intelligence Community underestimated ISIL and the president said that Clapper said that the Intelligence Community underestimated ISIL and yet to the braintrust, this is...what, exactly?